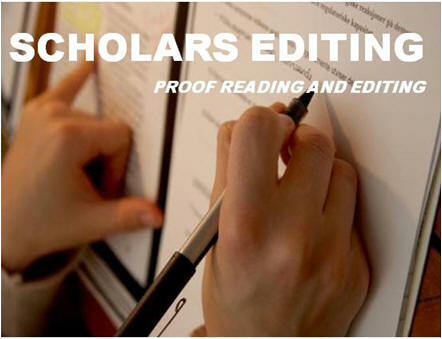 SCHOLARS EDITING is an online Translation, Proofreading and Editing firm that helps to increase the possibility of publishing articles in reputable journals. Most articles sent out for publication in scientific journals are often rejected by reviewers and editors because the English are not well polished. In the world of online research publishing, the ability to write in English at a high level is a major advantage. Non-native English speaking authors' works are often rejected by prestigious journals due to poor English, jeopardizing their chances for career advancement and recognition within their field. Our services at SCHOLARS EDITING include language translation (Portuguese, French, Russian, Spanish, Japanese, Chinese, Arabic, Turkish and other languages), editing, proofreading and formatting of articles to meet the structure and standard of the journal authors intend publishing, corrections of grammar, fixing of problem sentences, replacing inappropriate words, getting rid of spelling errors, re-arranging sentences and paragraphs if the need arises, in order to improve the overall clarity and organization of your articles and still retaining its overall tone. Our edited articles have been accepted for publication in numerous international standard journals such as Elsevier, Wiley Online Library, Oxford, PLOS One, Springer, Taylor and Francis and other reputable journals with high impact factor and high citation index.